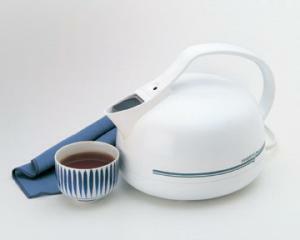 Boil up to a full quart of water superfast-even faster than most microwaves in this Presto electric tea kettle. It's great for tea, instant coffee, hot chocolate, gelatin desserts, hot cereals, instant soups and more. Built-in whistle indicates when water is boiling. Thermostat shuts kettle off automatically if it boils dry. Flip-up stainless steel lid makes filling easy and directs steam away while pouring. Anodized interior base resists mineral buildup.